Vella lives in the small village of Sugar Bunting with her family. She’s also set to be one of the maidens at the upcoming Maiden’s Feast in which she’ll be offered as a sacrifice to Mog Chothra in order to protect the village from destruction. Meanwhile, somewhere in the far reaches of space there’s a boy named Shay who can’t quite escape from the monotonous daily routine enforced by an overprotective mother. Much of Broken Age is about breaking away from what’s considered the norm and forging your own path in life. Throughout the game you’ll switch control between Vella and Shay as they both attempt to defy these established rules. There’s a great cast of characters to meet and an interesting world to uncover, but I think in the end it doesn’t quite come together in the most fulfilling way. 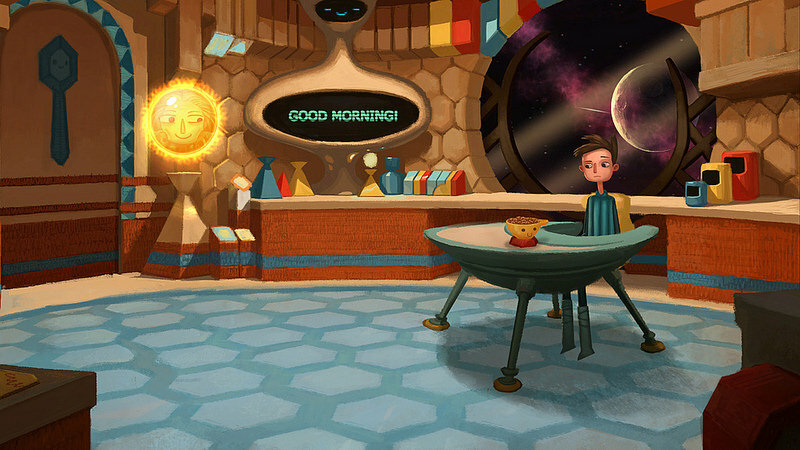 Despite releasing the game in two separate parts Broken Age feels like one complete game. There’s a clear point in which each part ends and begins, but it doesn’t quite feel like an episodic game. Of course that doesn’t matter for the PlayStation release as it is simply one game and never saw a segmented release. That said there’s a noticeable difference between the first and second half of the game. Personally I think the story has a better focus in the first half in comparison to where things go in the second. There are a number of small things that don’t feel properly addressed and the major conflict is essentially swept aside right at the end. (You’d expect Vella and Shay to have a stronger reaction to certain things that happen later in the story when they don’t.) Closing the game without really taking care of the major conflict doesn’t feel satisfying. There’s a clear ending to the game, but I wonder if there should have been a short final act that would allow our heroes to bring an end to the conflict for good. It’s disappointing because I think the first half of the game’s story is really strong. At the same time I think it’s interesting how the puzzle design clearly evolved between the two acts as it’s clear that feedback influenced Act 2’s design. The first half of Broken Age features pretty straight forward and logical puzzles. Adventure game veterans will likely find it to be really easy. The second half then sees a bit of a difficulty bump as the puzzle design starts to closely resemble that of old school adventure games. On average the later puzzles are more involved, sometimes they aren’t entirely logical, and there can be a fair amount of frustration associated with how obtuse things can be. In particular there’s a knot puzzle that’s too vague for its own good. (Without spoiling it too much the puzzle requires you to interpret super abstract drawings. It results in a lot of trial and error, a little luck, and enough frustration that I had to step away from the game for a few hours.) Thankfully the knot puzzle alone isn’t enough to drag the game down and I found the rest of the game to generally have good puzzle design. It’s also worth noting that the point and click controls have translated really well to a controller. I specifically liked using the right analog stick to snap to various hot spots that I could interact with. Within seconds it felt completely natural to control both Vella and Shay. Broken Age is a beautiful game. The environments, character designs, and animation are all so incredibly well done. In particular I really appreciated just how much detail went into Shay and Vella’s facial expressions among other little things within the world. There’s a lot of things going on that help to bring the world to life. Each location has plenty of objects to interact with and characters to meet that help to flesh out the story and give the world a bit more life. Curtis the lumberjack, a talking tree, and many others serve to be really weird and funny characters just to talk to. It’s actually kind of surprising just how much wood related humor one tree can handle. 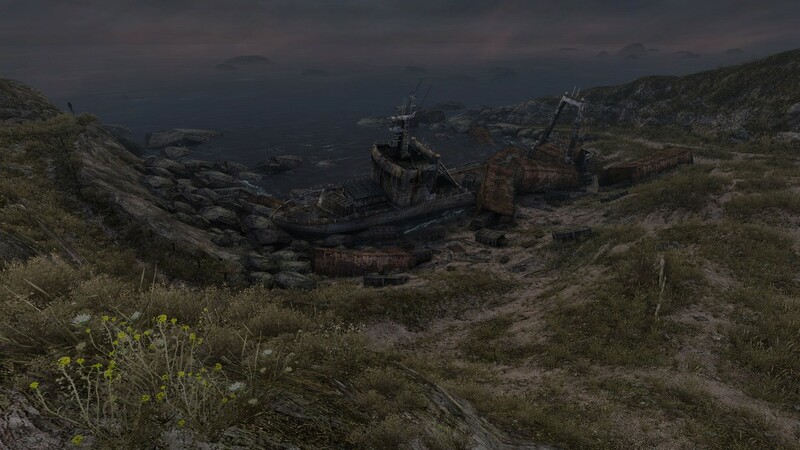 Unfortunately the second half of the game sees you retreading all of the same environments and talking with the same characters all over again. (Some of these screens have been edited, there are new puzzles to solve, and characters have moved around a bit.) It’s not completely identical and there are a few new screens, but it was a little disappointing that the last half of the game didn’t lead to more new areas. 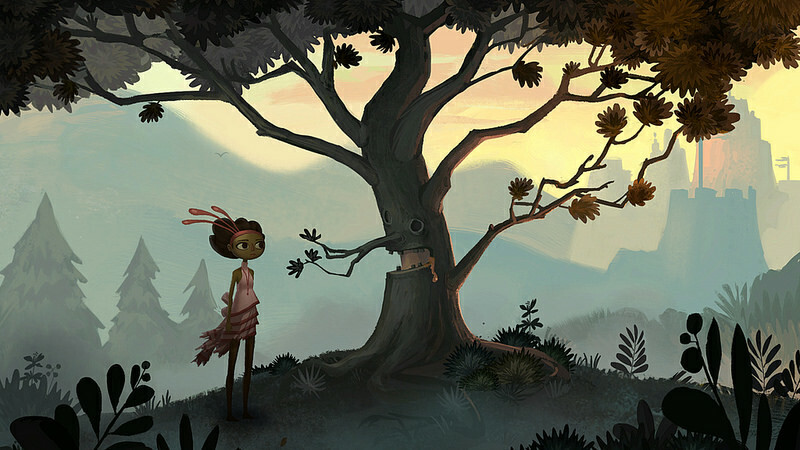 From Kickstarter to release Broken Age has been a long time coming and I think in the end it’s a pretty good adventure game. My issues with the game mostly pertain to the story and where it ends up after the twist that separates each act. That aside I really enjoyed meeting a large cast of characters and just exploring a fantastically detailed world. It’s a good game overall, I just wish so much of what made the story interesting wasn’t ignored in the end.